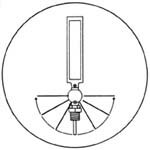 Adjustable Angle Thermometers - Philadelphia Instruments and Controls, Inc. - Specializes in the production of temperature related products. V-Shape aluminum case in durable attractive finish, lens front red reading mercury tube. Tapered stem precisely fits taper reamed separable socket assuring maximum heat conduction. Dual F° and C° scale available, custom temperatures ranges also available. The advances in thermometry in the first half of the eighteenth century included the significant work of Guillaume Amontons (d. 1705) on gases. He studied the expansion of gases on heating but did not achieve formulation of Charles' Law. He developed the air thermometer, which measures the increase in pressure of a system of constant volume when the temperature increases, and also made significant studies of the liquid-in-glass thermometer. The liquids used in a thermometer by Amontons, and still used today, are alcohol (with red dye in it, used at low temperatures), linseed oil (for higher temperatures), water, and mercury.